Picture all you can imagine! Supercharge your workflow with the next generation of high-quality image editing and processing. Utilizing U Point technology, Nikon Capture NX delivers powerful tools to help you fully realize the potential of your photographic imagination. Capture NX software releases not only the power of Nikon's Electronic Format (NEF) files, but for the first time, it makes JPEG and TIFF processing and editing elegant and easy enough for any photographer to use. There are no complicated procedures. Nikon's interface provides an intuitive access to all of the tools you need. 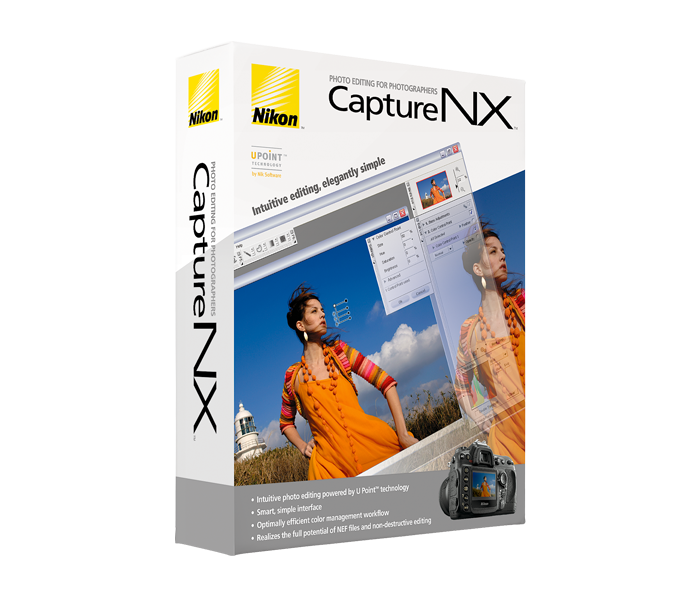 Make your photographic possibilities endless and realize the power of your imagination with Capture NX. CPU: PowerPC G4, PowerPC G5, Intel Core Duo, Intel Core 2 Duo, Intel Xeon. OS: Mac OS X (version 10.3.9~10.4.11); Operation with Mac OS X 10.5.x Leopard is not guaranteed or tested. RAM: 256 MB minimum (1.0 GB or more recommended). Hard Disk: 200 MB required for installation. Display: 800 x 600 pixels (1024 x 768, or more, is recommended) with 16-bit colour (High Colour/thousands of colours) or 24-bit colour (True Colour/millions of colours) recommended. * CD-ROM drive required for installation. * Internet connection required for some options. CPU: Pentium III, 1GHz or better (Pentium 4, 2GHz or better recommended). OS: Pre-installed versions of Windows Vista (32-bit Home Basic/Home Premium/Business/Enterprise/Ultimate editions), Windows XP Home Edition, Windows XP Professional, Windows 2000 Professional.